Dive into a fun indulged game at Wicked Jackpots on the classic mix of bingo and slots, Big Money Slingo Bonus! Enjoy the various rewards in store! 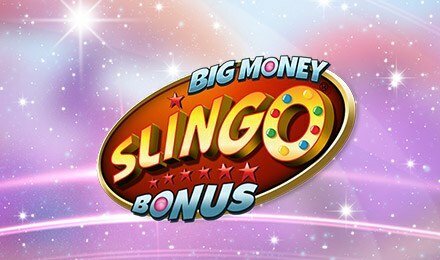 Big Money Slingo Bonus is a sequel to its big brother Big Money Slingo. The aim of the game is to make Slingo horizontally, vertically or diagonally across the 5-reeled gird. The combination of bingo and slots displays cash pointers that announce your wins. By making Slingos on the reels, you will collect keys which will activate the bonus wheel. On the Bonus Wheel, grab a chance of winning a guaranteed £250 win! Here you can pocket instant wins! Also, there’s a high chance of triggering the £250,000 jackpot and free spins.